Saturday, March 31, 2018, is the date of the Great Vigil of Easter, Holy Saturday, at MLLC. For many in the church around the world, this is the centerpiece of their year as followers of Jesus. After hearing our stories, we make our last minute preparations to meet our Lord. All must be right for the feast. On some years those among us who have not yet joined us are brought into membership with us this night, making all who are here part of the Church family, known as the Bride of Christ. Each year, so that the whole family is prepared, each of us reaffirms our faith through the Apostles Creed. As we interact with the water and the Lord, we hear and we feel that grace which was given to us through our baptism. The Great Vigil of Easter – 7 p.m. on Saturday, March 31 – see the introduction above. Shared with Waldeck Lutheran Church. Easter Sunrise – 6:45 a.m. on Sunday, April 1, at the Carmine Cemetery. Bring a lawn or folding chair for seating. Shared with Waldeck Lutheran Church. 9:00 a.m. – Sunday School in the Fellowship Hall. A light reception in the Parlor, near the sanctuary entrance and church offices. We invite you to be part of our celebrations and observances as we remember all the great things Jesus has done for us. Every year around this time we gather to ponder anew the suffering, death and resurrection of Jesus. We get to revisit the central parts of our life and faith with him. Everything else in our life and faith makes sense and matters because of the things we ponder this week. Each service has a focus on the various actions and events in this final week of Jesus’ ministry on earth. Palm Sunday reenacts Jesus’ Triumphal Entry into Jerusalem. Maundy Thursday revisits the major actions of Jesus at the Last supper with his Disciples. These include the washing of the Disciples’ Feet, the Command to Love, the Institution of the Holy Communion, and the Arrest of Jesus. Good Friday invites us to gather at the Cross of Christ. On the Cross he suffers and dies for the forgiveness of our sin. On Holy Saturday we gather for the Great Vigil of Easter. In this time we gather with the followers of Jesus to wait for the fulfillment of his promise to Rise from the dead. In this service we light a new fire in hope of the Resurrection. We tell the stories of faith from the Old Testament. We celebrate the gift of Baptism which is our holy connection to the death and resurrection of Jesus. In the end we renew our commitment to follow Jesus as we celebrate the Lord’s Supper at the beginning of our Resurrection Celebration. Early on Sunday we gather in the Carmine Cemetery for our Easter Sunrise Service. This is an ancient tradition of Christians. Our brothers and sisters in the faith have gathered in cemeteries early on Easter Sunday since the earliest days of the Church. We do this to reconnect with the place of Jesus’ Resurrection. He was raised from the dead in a graveyard of sorts, the borrowed tomb in which Jesus’ body was placed. It was early in the morning on the first day of the week, as we read in John chapter 20. Later that morning we celebrate with the whole Church that Jesus Christ has been raised from the dead. Here is the schedule of our Holy Week Services. We will also include the schedule of services at our partner church, Waldeck Evangelical Lutheran Church near Ledbetter. All are welcome at these services at either church. Sunday, March 25 – 8:00 a.m. at Waldeck; 10:00 a.m. at Carmine. 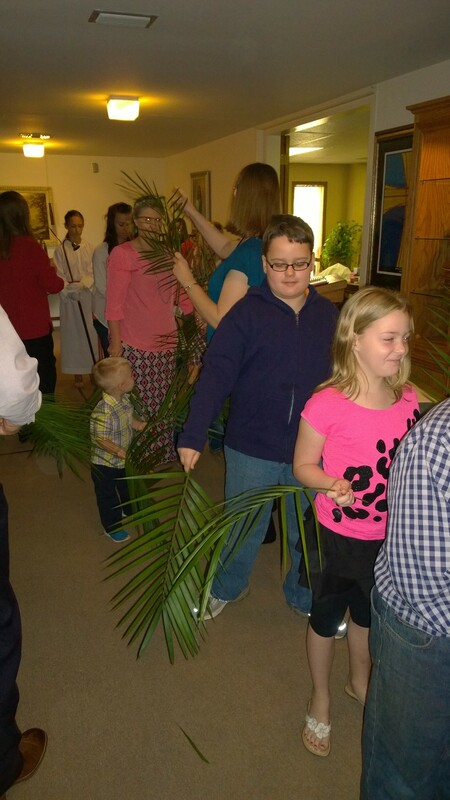 Both Sunday services will include the procession of Palms. Waldeck will also include the Passion story from Mark’s Gospel. Sunrise Service – 6:45 a.m. at the Carmine Cemetery – bring a lawn chair for seating. We will gather among the graves. If inclement weather we will gather in the pavilion at the cemetery. At Waldeck: 8:00 a.m. Festival Service – outside in the pavilion on the south end of the church building. If inclement weather, inside the church. Holy Communion. The service will be followed by a pot-luck brunch in Annex. An Egg Hunt will be offered around 9:30 a.m.
10:00 a.m. Easter Festival Service with Holy Communion. 11:15 a.m. Easter Egg Hunt, outside the Sanctuary entrance. Carmine: Sunday School at 9:00 a.m.; Sunday Worship at 10:00 a.m.
Worship on the 2nd and 4th Saturdays at 6:00 p.m.
Waldeck: Sunday Worship at 8:00 a.m.; Sunday school at 9:15 a.m.
We will gather together on Friday, April 14, at 7 p.m. at MLLC to remember the events of Good Friday. This is our annual remembrance of the dramatic sacrifice of Jesus for the forgiveness of our sin. We begin our liturgy as we ended the Maundy Thursday Liturgy: in silence. What was begun then continues this day as we journey with our Savior from the Last Supper, the stripping and humiliation, to the cross and tomb. Good Friday is the second day of the Triduum, the “Three Sacred Days” of Maundy Thursday, Good Friday, and Holy Saturday with its Vigil of Easter. The Good Friday Liturgy is marked with austerity, silence and reflection. The chancel itself is bare from the Maundy Thursday “Stripping of the Altar”. There is no organ music except to accompany the hymns. Everything focuses on our adoration of the crucified Christ, reigning from the throne of the cross. The service of Tenebrae is an ancient Holy Week devotion which began in the 7th or 8th century, or possibly earlier. The name “Tenebrae” means shadows. The service takes its name from the ceremony of extinguishing in succession all the lights in the sanctuary, casting it into total darkness which is symbolic of the disciples’ desertion of our Lord, and of his death and burial. The purpose of the Tenebrae Service is to aid us in realizing the total impact of the darkest day in the history of the world, the day Jesus died on the cross. The opening portion of the liturgy includes no praise. It proceeds directly to the Invocation and Prayer of the Day. It is a simplified version of our Sunday Liturgy of the Word. The chief acts are the reading of the Passion of St. John and the Bidding Prayer for the needs of our world. Following the final hymn is a meditation on the Seven Last Words of our Lord which he spoke from the cross. After each word is read, there will be a prayer and silent meditation. Lights and one candle will be extinguished after each meditation until the sanctuary is in darkness. After the lights are all extinguished, the congregation will stand as the Paschal Candle is carried from the sanctuary reminding us of the burial of Jesus. A loud noise, made by the closing of a Bible, will remind us of the closing of the tomb. This announces the fulfilling of the Scriptures and the completion of our Lord’s work on the cross for us. The Paschal Candle (called the Christ Candle during Advent/Christmas) will not return until the beginning of the Great Vigil of Easter on Saturday evening at 7 p.m. On Good Friday we recognize that Jesus was fully dead and was placed in the borrowed tomb. Note: The return of the Paschal Candle moments after the loud noise is a form of the Good Friday service designed to be used in those congregations which do not have the Great Vigil of Easter. All will leave in silence to return tomorrow as we wait in vigil and then celebrate our Lord’s Resurrection at the Great Vigil of Easter. At the Vigil tomorrow evening we will have the first Holy Communion in celebration of the Resurrection of our Lord Jesus Christ. Easter Vigil – Saturday – 7:00 p.m. – in sanctuary – a joint service for both MLLC and Waldeck. Waldeck Festival Service – 8:00 a.m., followed by a Pot-luck Easter Breakfast. Also and Easter Egg hunt will happen around 9:30 a.m. Egg hunt for the children. ~11:15 a.m.
Worship on Saturday at 6:00 p.m., Sunday at 10:00 a.m.
Palm procession and entering into Holy Week. Holy Communion. 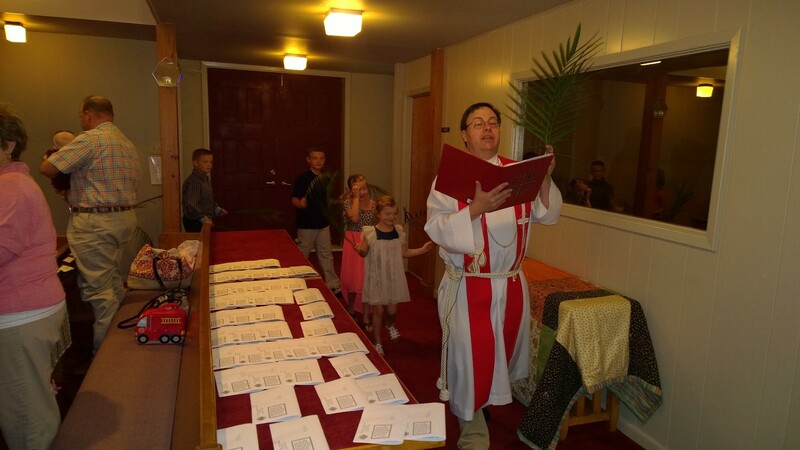 First Holy Communion, presentation of Bibles to First Communion Students, the washing of Feet – following the example of Jesus (we will also offer the washing of hands), Stripping of the Altar. 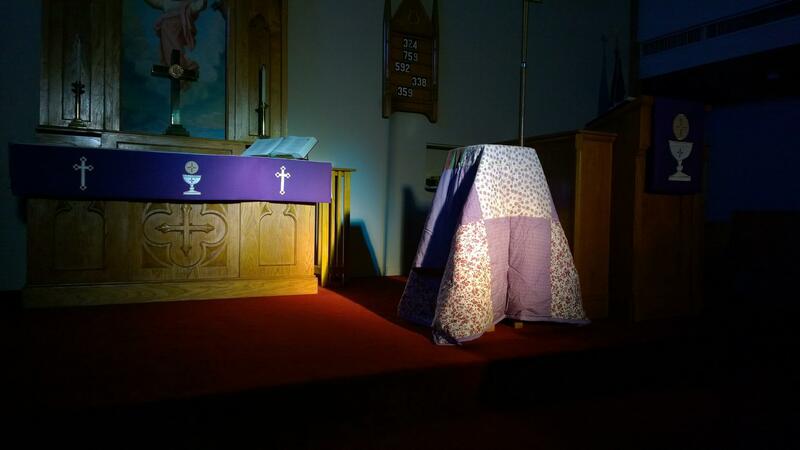 There will also be a Maundy Thursday Service at 5:45 p.m. at Waldeck Lutheran Church, our shared ministry partner. The Church is located at 6915 Waldeck Church Lane, Ledbetter, TX 78946 – this is about 6 miles south of Ledbetter at the corner of FM 2145 and FM 1291. Remembering the Suffering and Death of Jesus Christ our Lord. This will include the reading of the St. John Passion account from chapters 18 and 19. This is a shared even with Waldeck Lutheran Church. Service of Light, Services of Readings, Remembrance of Baptism, First Holy Communion in celebration of the Resurrection of Jesus Christ. Remembering Jesus’ death on the cross. A grand celebration of the Resurrection of Jesus Christ our Lord! Sunrise Service 7:30 a.m. – Carmine Cemetery – bring a lawn or folding chair for seating. The service will be held at the covered pavilion at the cemetery in the event of rain. Sunday School Resurrection Celebration and Egg Hunt ~10:15 a.m. The area near the Altar is bare of decoration. This a result of the “Stripping of the Altar” on Maundy Thursday. Candles for Good Friday are added, as well as a simple, wooden cross. The Good Friday Liturgy is marked with austerity, silence and reflection. The chancel itself is bare from the Maundy Thursday stripping. There is no organ music except to accompany the hymns. Everything focuses on our adoration of the crucified Christ, reigning from the throne of the cross. Resurrection Sunrise service at 7:30 a.m. at the Carmine Cemetery. Breakfast in the fellowship hall at 8 a.m.
Festival Resurrection Service at 9:00 a.m. Egg hunt and party for the children. ~10:15 a.m.
Thursday, April 2 is our Maundy Thursday service. We invite you to gather with the people of God at MLLC at 7:00 p.m.
We believe it is an important and faith enriching experience to be part of these special days. Worship will be each night at 7:00 p.m. These Three Days together are called the Great Triduum. *Maundy Thursday – April 2 – We connect with the events of the Last Supper of Jesus with his Apostles. We also remember his betrayal and arrest. *Good Friday – April 3 – We connect with the suffering, death and entombment of Jesus Christ. *The Great Vigil of Easter – April 4 – We remember the waiting of the followers of Jesus when he was in the tomb and before he was raised from the dead. We celebrate the victory of the Resurrection from the dead of Jesus. The Maundy Thursday service is one of endings and beginnings. What was begun on Ash Wednesday is brought to a close here today. What begins today does not end until the Day of Resurrection. It is the ancient Triduum, “The Three Sacred Days,” which lead us to the celebration of the Resurrection of our Lord: Maundy Thursday, Good Friday, and Holy Saturday. The theme is love, our Savior’s love for us, expressed in the washing of the disciples’ feet, in giving himself in bread and wine, in dying upon the cross. An invitation to confession is given. The focus is on forgiveness. On Ash Wednesday, we began Lent with a major act of confession and ashes, but we did not receive a strong statement of forgiveness in the absolution. That bold announcement of forgiveness comes now, “In the mercy of almighty God,” and “in the name of the Father, and of the Son, and of the Holy Spirit,” at the service celebrating Christ’s love. The lessons of love are read. A new command derives from it: “Love one another.” The name “Maundy” comes from the first word of the Latin form of John 13:34: “Mandatum novum do vobis ut diligatis invicem sicut dilexi vos” (“I give you a new commandment, that you love one another. Just as I have loved you, you also should love one another.”). This self-giving love is demonstrated in the washing of feet. The prayers are said. The table is made ready. 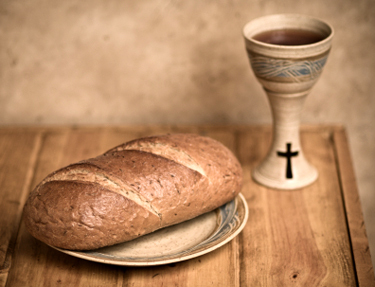 The time of the Lord’s Supper arrives, and our Lord is revealed in bread and wine as once he “revealed himself to his disciples.” It is a solemn moment, but we cannot linger here. Nor could the Lord, for His betrayal was imminent. Before we know it, the markings of betrayal are seen before us. 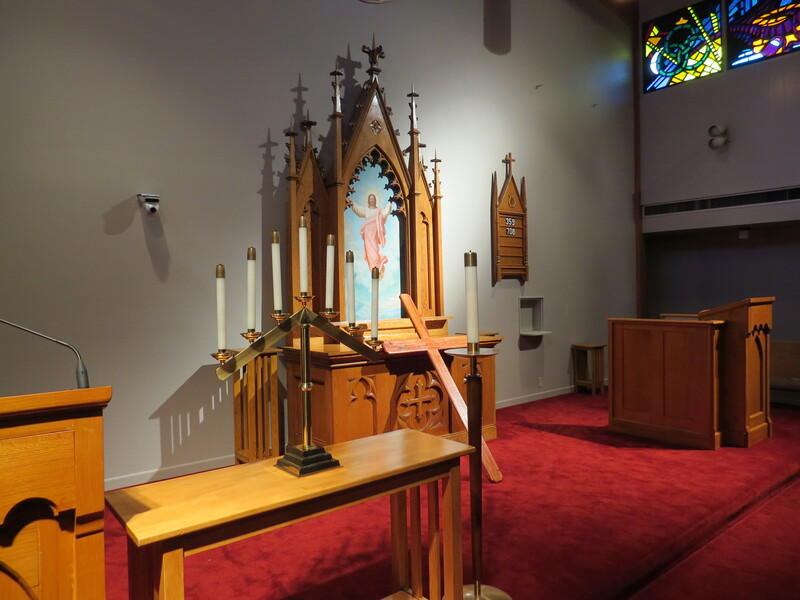 The symbol of Christ in our midst, the altar, is stripped bare. Christ is stripped of his power and glory. Good Friday is inescapable. The powers of darkness work upon him. In silence, we depart without benediction. The Three Sacred Days continue with the Good Friday service on April 3 at 7:00 p.m. We will also gather on Saturday evening, April 4 at 7 p.m. for the Vigil of Easter. 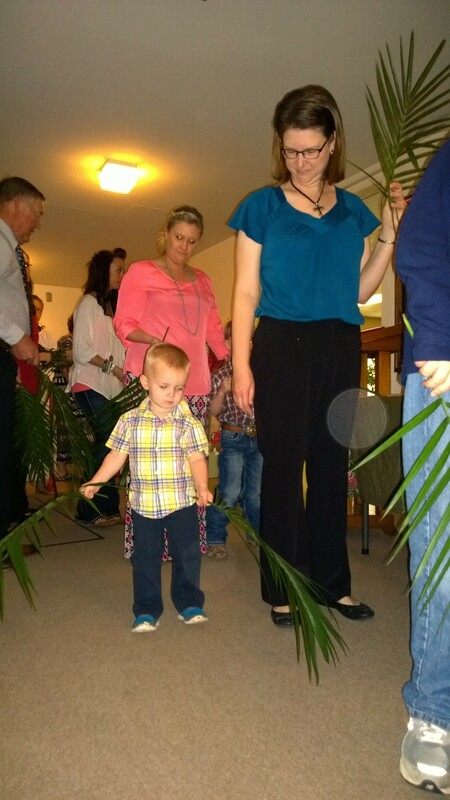 As always we celebrated a joyful Palm Sunday at MLLC. It was great to have a wonderful crowd for our Saturday evening and Sunday morning worship services. Together we remembered the work of Jesus Christ as he entered Jerusalem on a donkey. This entry began the week of dramatic events which provided for the salvation from the final power of sin, death and evil for all who would believe in him. Our young people were joyful leaders in the Palm Procession. The group circled the sanctuary while we sang the traditional “All Glory, Laud and Honor”. The Palms were then placed before the altar to remember that the people covered the road with palms over which Jesus rode the donkey. Some of the children also gathered up front for the Children’s Time. As part of this time the youth learned about the quilts and where these are sent around the world. 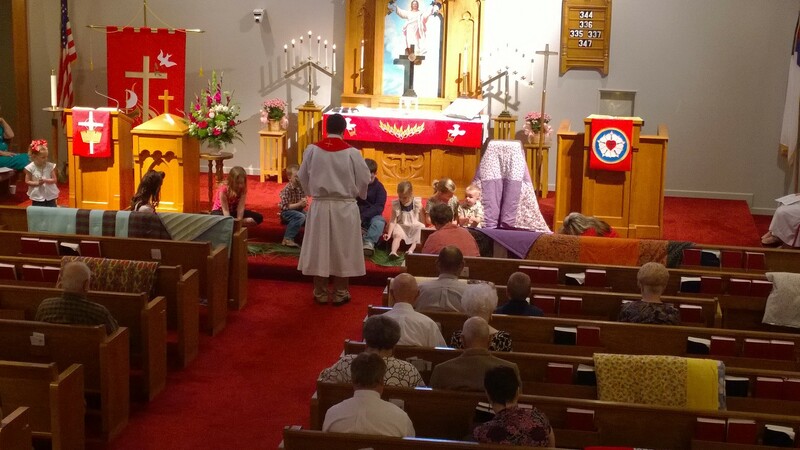 Later during worship we dedicated the quilts and kits for Lutheran World Relief. Here are how the quilts were displayed. Note the palms before the altar. 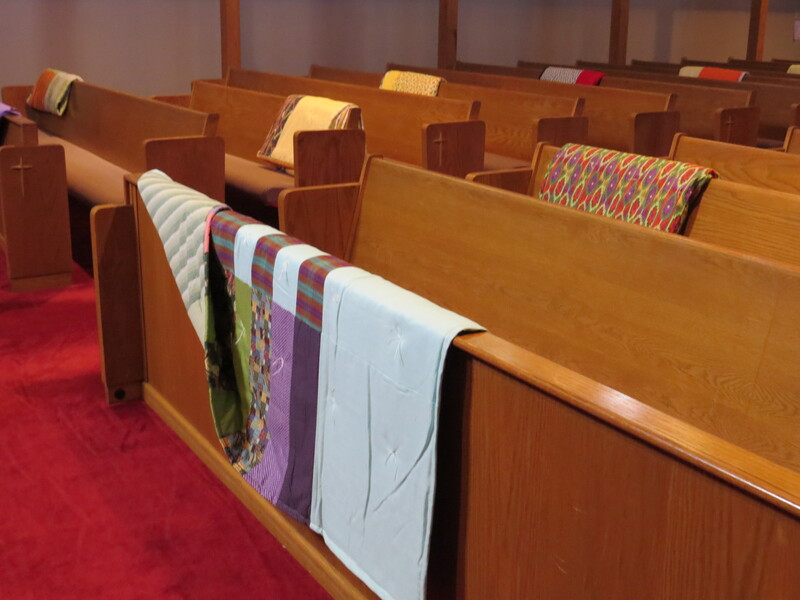 There is a wonderful article on the Lutheran World Relief web page about the Mission Quilts. You are encouraged to click over to this page to read more about this wonderful ministry. 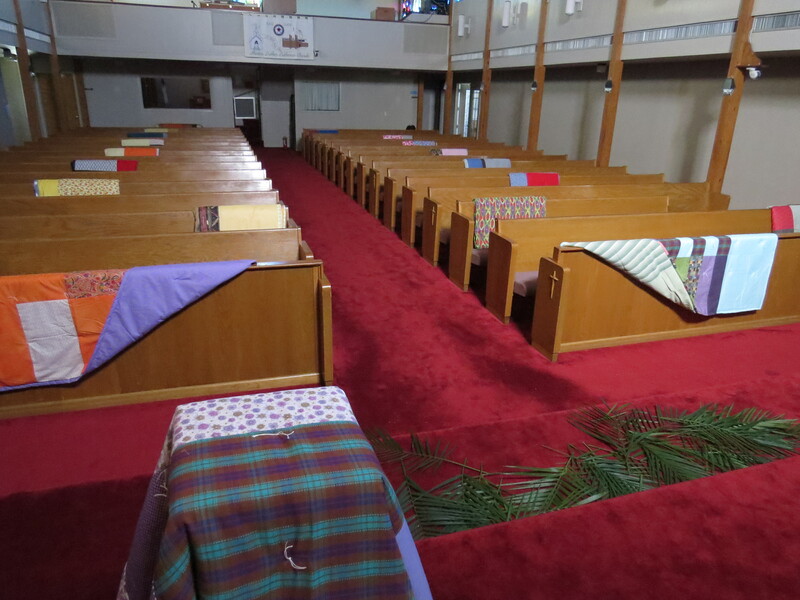 The quilts displayed in the sanctuary on Palm Sunday were the ones for Lutheran World Relief. Many more are prepared and sent to two other ministries. Several are made for Camp for All in Burton. A set are also made for Krause Children’s Center in Katy. We are looking forward to a joyful Palm Sunday 2015. There is always much to do to get ready for this special event. This is the beginning of Holy Week – click here for our schedule. 1. We will dedicate the quilts for Lutheran World Relief. See the photo above which was taken right after our quilts were placed for this dedication. Photo Credit: Melissa Wickel. 2. 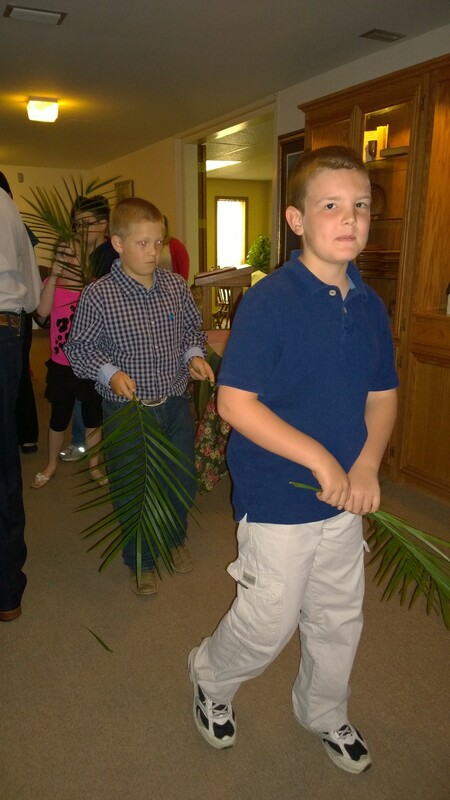 We invite children to participate in the Procession of Palms on Sunday. We gather in the Narthex for this joyful celebration of Jesus’ entry into Jerusalem. Plan now to participate. 3. We will have worship on both Saturday night at 6:00 p.m., and on Sunday at 9:00 a.m., on Palm Sunday weekend.